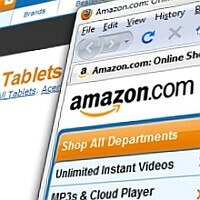 As if the tablet field wasn't large enough, Amazon is insisting on joining in the fun. But before you judge too quickly, keep in mind the incredible amount of content that Amazon is capable of bringing to the table(t). And those industry relationships are probably behind the optimistic predictions for the Amazon Android tablets' sales. Taiwanese parts suppliers are saying that Amazon's tablets will launch in August or September, and still manage to sell 4 million units in 2011. Unrealistic? Maybe. It will depend on two things: the components, and the content. As for the components, earlier rumors suggested that the 10-inch Hollywood tablet would sport NVIDIA's upcoming quad-core processor. But now, the same report from DigiTimes suggests that the processors will be supplied by Texas Instruments. As for content, DigiTimes reiterates the rumor that the Amazon Prime streaming video service will be featured on their tablet. But we don't know if that will be enough to grab customers from other, more established device-makers. Amazon also has a cloud service in the pipeline. But again, that might not differentiate it from other pre-holiday tablet contenders.